Dinner: We went to the Luling Watermelon Thump and had street food for dinner. It was pretty hot out there so we started off with a large serving of shaved ice (with watermelon and strawberry syrup) followed by some pork rinds (we couldn't resist - Tina and I had been craving chicharrones for the last week). 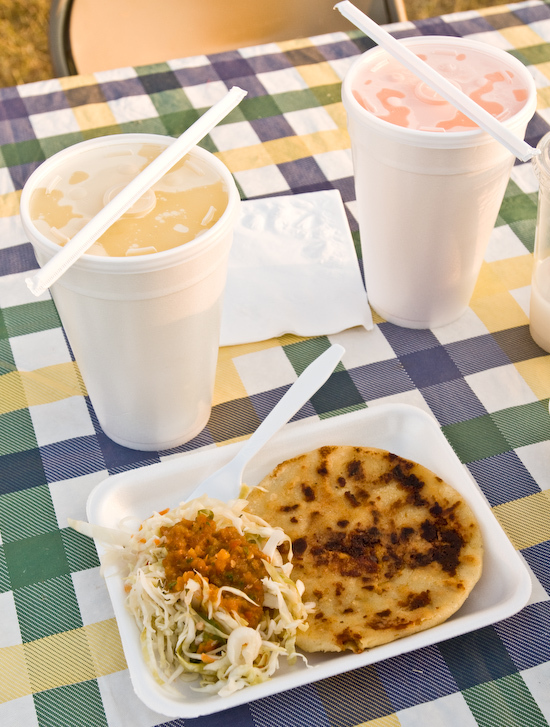 On our way out of the festival, we passed a stand selling pupusas - a Salvadorean flatbread stuffed with meat and cheese. We each got ourselves a pupusa de chicharon con quezo (according to the sign). There is definitely a joy to eating street food that I can't get elsewhere. We also had several large cups of aguas frescas - horchata, watermelon, cantaloupe, and pineapple. How was the okra prepared? The okra was simply pan fried in canola oil for a few minutes on each side and seasoned with salt.